I'm really fortunate because there's been some great footballers in my time who didn't get this opportunity, so I'm really rapt I could do that. BREE White is retiring as one of the lucky ones. 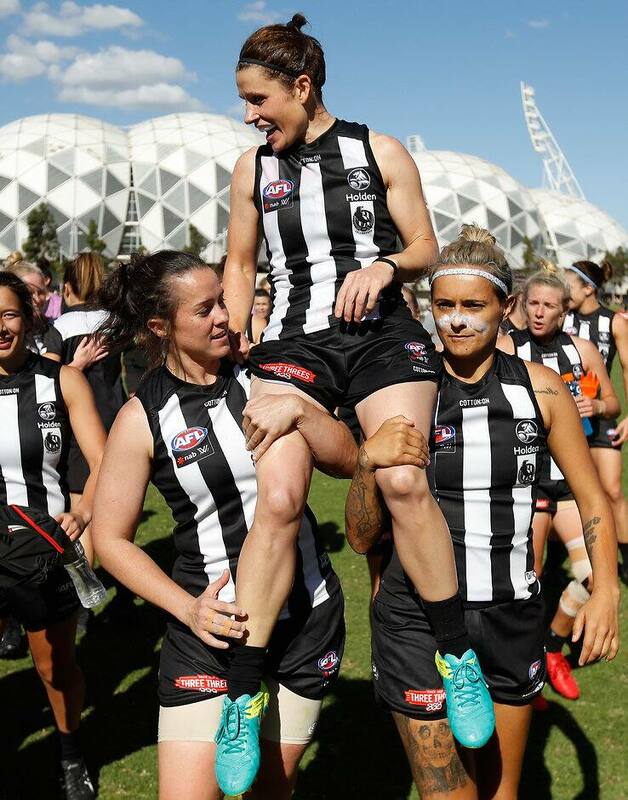 The 36-year-old Collingwood player has been around football for a long time, first pulling on the boots for VFLW side VU Western Spurs back in 2000 as an 18-year-old. She's played with countless footballers who missed out on the chance to play at the highest level because of their gender and had retired by the time the NAB AFL Women’s competition came around. "It's been great to hold on [and play AFLW]," White told AFL.com.au after her last game, a win over Adelaide last Sunday. "I'm really fortunate because there's been some great footballers in my time who didn't get this opportunity, so I'm really rapt I could do that. "Hopefully these girls [her teammates] can continue that tradition and it just keeps growing and growing and women's football gets to where it deserves to be." The midfielder finished her AFLW career with 11 games, averaging 8.5 disposals and three tackles a match. She kicked her one and only AFLW goal last year, against Fremantle in round five. "Two years doesn’t sound like much, but I'll remember every minute of it. It's been great," she said. A physical education teacher at Moonee Ponds West Primary School in Melbourne's inner north-west, White is seeing the impact AFLW has had on the local community. "There are a lot of girls playing Auskick and school footy. We have way more girls in our school team (a mixed competition), so you can see the benefits rolling through and it's just really positive," White said. "The kids come in and ask you about the game on the weekend and we talk about all the little things that happen. "So, it's exciting for them but it's exciting for me as well to see their interest in that has grown and having positive female role models is important as well." Collingwood finished its season with a bang after a poor start, recording its three wins in its final four games, as it did last year. But White is backing the Magpies to turn things around in 2019. "Hopefully they take that confidence (from the late-season wins) into the pre-season and come out firing next year," she said. White has not hung up the boots entirely. She plans to play a few games for the Spurs (now known as the Western Bulldogs at VFLW level) through winter. She won the club’s best and fairest award last season as a playing assistant coach. "I'll be an assistant coach with [head coach] Debbie Lee. We've got a pretty young group, so I might play a couple of games just to help out," White said. "I'll be pretty limited, it won't be a full-on season. But you might see me running around a couple of times."